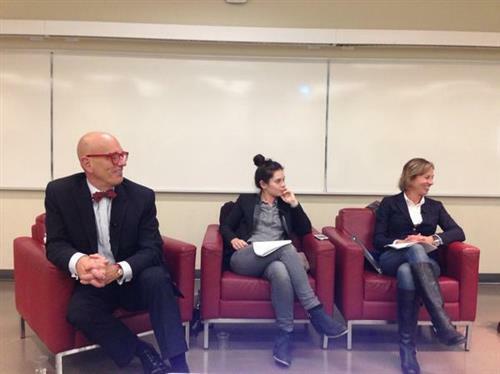 Join us on October 9th, 2014 from 3:30 p.m. to 5 p.m. as Globe and Mail reporter Robyn Doolittle, former Toronto city councillor Karen Stintz, and CP24's Stephen LeDrew take part in the Ryerson MBA Speaker Series. All three guests will discuss the mayoral race and answer questions from the audience. Tweet reporters Sarah Traynor (@tweetTraynor) and Emanuela Orsini (@emanuelaors) with your questions and comments. Stintz: We have a funded plan to improve transit. The govt needs to fund it. Doolittle: Toronto doesn't have the money to build transit. Torontonians shouldn't have to pay for it on their own. Doolittle: Toronto doesn't have the money to pay transit. Other levels of govt need to help. Doolittle: Candidates can't say that though. They have to put out a transit plan. LeDrew won't say who has the best transit plan because the event is being recorded. LeDrew: On the piece of track going to LRT here - The federal and provincial govt needs to give more money. Lean: Political campaigns is not the time to give detailed plans for transit. Lean says races are not times for detailed policy debates. Says none of the candidates plans works. Lean says the ballot question should be who can best bring the other levels of government together to help fund transit. Lean says if you really cost out all candidates transit plans, none of them work. None of them. Lean says honesty in politics doesn't work. Stintz says city hall is the only level of government that has a consensus based model. Says sometimes that model is messy. Stintz says future mayor needs to be able to play in that arena. LeDrew: Political sphere at its all time low. Not a great debate going on right now. Appalling level of debate. LeDrew says we've got an appalling level of debate right now. Encourages us to vote. Doolittle says council actually works quite well. Despite what was going on in past 4 years, council was still moving forward. Doolittle: Chow- not a great communicator, that's the problem. Doolittle says huge part of job is being good communicator. Says thats why Chow might not be doing well. Lean asks Doolittle if he thinks there's any way Chow could win? Doolittle: As far as I'm concerned, people want the NOT Ford person. The way Chow can win: Ford gains on Tory, surpasses him, & then people think Tory can't beat Ford, then people will go back to Chow. Thats according to Robyn Doolittle. LeDrew: Not possible for Chow to win. She is not a good communicator. LeDrew says that's impossible because Chow has an NDP platform and she's a bad communicator. Doolittle stressing that people don't care who wins, they just want to "Not Ford." Doolittle: I think it's a race between John Tory and Doug Ford. Stintz: I think a poll will show that Doug Ford still has traction. But who knows what will happen. LeDrew: I think there's zero chance of Chow winning. Lean says there is zero chance Chow will win. But says he's biased because he's never supported NDP. But says she's pleasant and passionate. Lean: I think she's a really bad performer, no possibility. I don't see Doug winning. Wrapping up now. Lean thanking them all for coming. LeDrew says Q's were terrific.